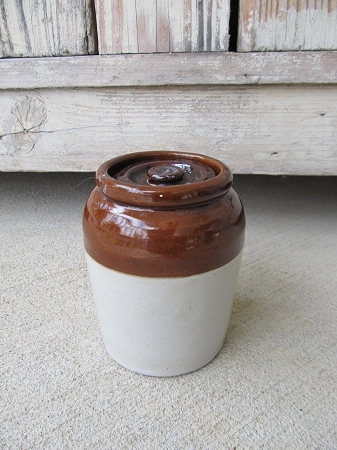 Antique Stoneware Little Brown and Tan Stoneware Jar with Lid. This little jar is so adorable. Perfect for kitchen display or mix in with your primitives in your living room, etc. Brown and tan colored stoneware, has a stoneware lid that is in perfect shape. Rare that it still has it's lid and it's not chipped or cracked. Great shape, not sure of age. Has a number 8 on the bottom. I have one displayed in an old cabinet in our master bath. Love the farmhouse chic look of these as well. This one is a tiny one, so adorable. Size is 4" high x 2 3/4".